Mary Ann Heath started her baking career at the age of 14 working at Moss Rose Bakery. Ten years later, she bought the place. Early on Mary Ann had a vision of what a quality bakery should offer to her customers and her community, and she’s been serving up greatness for the last 30 years. 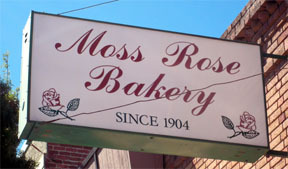 Moss Rose Bakery has been an Oakdale landmark since 1904. Along with the rolls, pies, cakes, cookies and donuts – customers from all around Moss Rose Bakery for the amazing French bread that is baked fresh every day in the 100-year-old brick oven. Everyone at Robb Ross Foods thanks you for making us your exclusive bakery goods supplier for the last 30 years. And, of course, congratulations to you Mary Ann for receiving the Lifetime Achievement Award from the Oakdale Chamber of Commerce. It is truly a deserving recognition.